Bravos® laundry pairs are Better Built to deliver all kinds of clean for all kinds of clothes. It starts with this 4.3 cu. ft. washer. We combined the Best Cleaning in its class driven by the PowerWash® system with the steel rod construction of the industry-exclusive Smooth Glide drawer. This means you can count on added movement from the Power™ Impeller for deep cleaning, and consistent loading for your detergent in our optimal dispensers. 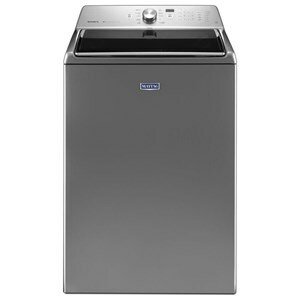 Plus, this model is built to last thanks to the sturdy Maytag® Commercial Technology we put under the hood, and the 10-year limited parts warranty on the drive motor and wash basket. The Washers 4.3 cu. ft. Bravos® Top Load Washer with Exclusive Smooth Glide Drawer by Maytag at Pedigo Furniture in the Livingston, Onalaska, Trinity, Coldspring, Corrigan, Huntsville, TX area. Product availability may vary. Contact us for the most current availability on this product. Maytag washers feature Maytag Commercial Technology (MCT) and long-lasting commercial-grade components like the belt and motor for your home. The performance series washers feature the sanitizing power of steam to eliminate dust mites and remove allergens without bleach. 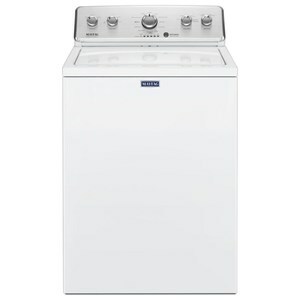 The Washers collection is a great option if you are looking for Appliances in the Livingston, Onalaska, Trinity, Coldspring, Corrigan, Huntsville, TX area.